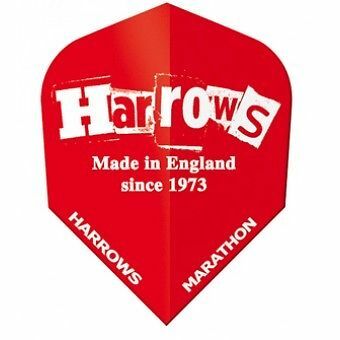 Harrows Darts flight. Made in England. Harrows Assassin 80-18gr-steeltip_pack darts. Made in England. 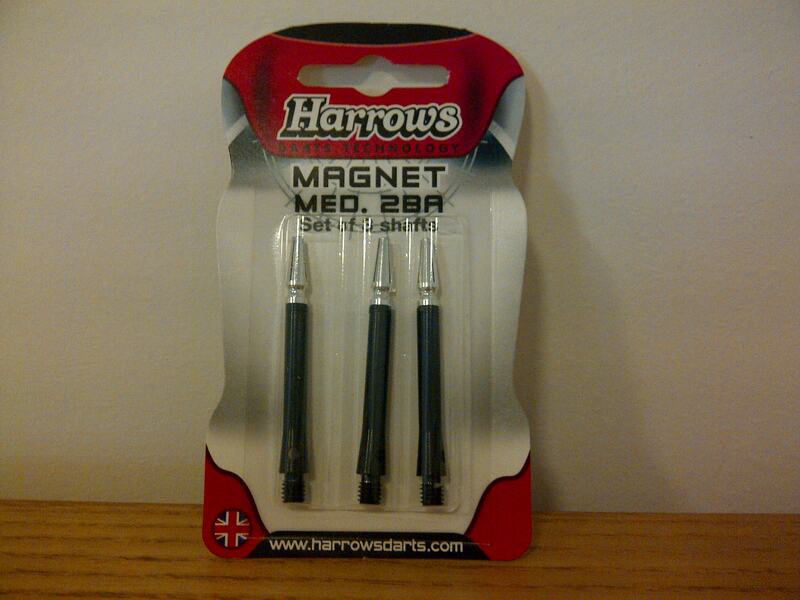 Harrows MAGNET Dart Stems / Shafts; Black, Medium. Made in England. Photograph by author. 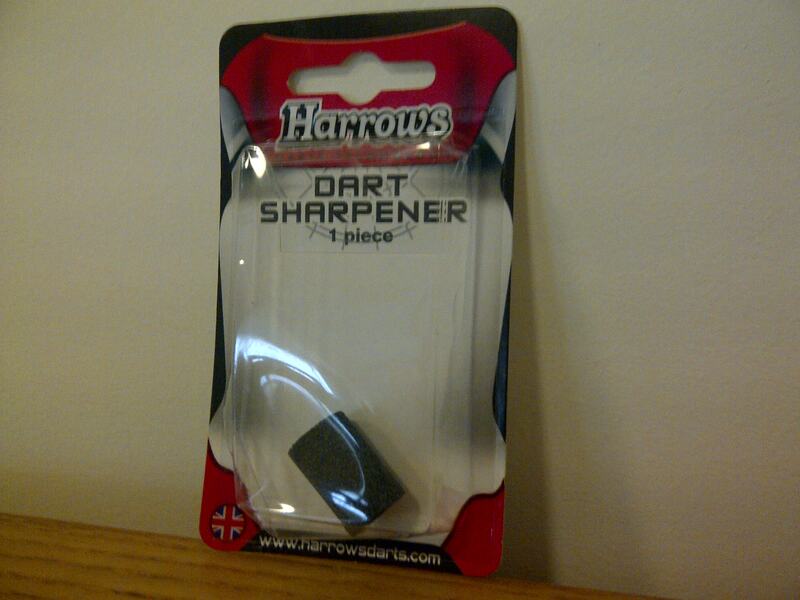 Harrows Classic / Basic / Standard – Round Stone – Dart Points Sharpener. Made in England. Photograph by author. 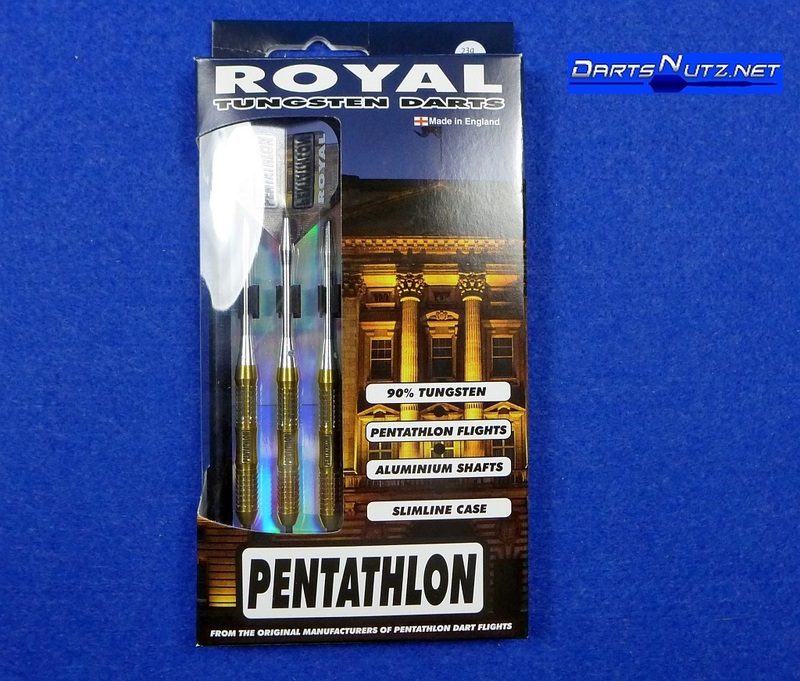 Pentathlon Royal 23g darts. Made in England. As far as I know Bulls Eye Darts are unconnected with Bullseye, the 80s TV game show with Jim Bowen and Bully. Winmau darts and dart boards are made in Kenya. They do not giving any information about country of manufacture on their website. Winmau are owned by Nodor who also do not give any information about country of manufacture on their website and presumably all their manufacturing is also abroad. The little Union flag on their logo is therefore misleading. Unicorn darts and dart boards are made in China. I understand the company moved production to China in 1999. Datadart don’t give any country of origin information about their darts or darts accessories on their website (which suggests they are foreign made), but it would be worth checking with them just in case they are made in the UK. I have seen a couple of articles on the web suggesting they are. Mitchell Sydney Swans Afl Team Darts are designed in Australia and made in England. The packaging says Made in England. That’s about all I know about these darts (I found them on eBay and on a website called Mal Atwell). Does anyone know of any other British made darts please? Or British made dart boards? Or British made darts accessories? UK made darts. British darts. British made darts. Darts manufactured in the UK. Made in England darts. Dart boards made in the UK. British made darts accessories. British made darts equipment. UK made darts boards. UK darts. Darts made in the UK. Darts from Great Britain. This entry was posted in Darts and Dart Boards, Sports and tagged Amazon, British made dart boards, British made darts, Bull, Bulls Eye, Bulls Eye Darts, Bullseye, Canaveral darts, Dart Accessories, Dart Boards, Darts, Darts and Dart Boards, Darts Boards, Decathlon Darts, Elkadart, Geologic darts, Geologic feathers, Geologic shafts, Harrows, Harrows Dart Boards, Harrows Darts, Mitchell, Pentathlon, Retriever Sports, Target darts, UK, UK made dart boards, UK made darts, ukmade darts on June 22, 2014 by ukmade.